Lineage. Constituted as 380 Fighter Squadron (Single Engine) on 11 Feb 1943. Activated on 1 Mar 1943. Redesignated as: 380 Fighter Squadron, Single Engine, on 20 Aug 1943; 160 Tactical Reconnaissance Squadron on 25 Aug 1944; 160 Reconnaissance Squadron, Photographic, (Jet Propelled), on 29 Jul 1946; 160 Tactical Reconnaissance Squadron, Photographic-Jet, on 14 Jun 1948. Inactivated on 26 Apr 1949. Redesignated as 160 Tactical Reconnaissance Squadron, Night Photographic, on 8 Aug 1950. Activated on 1 Sep 1950. 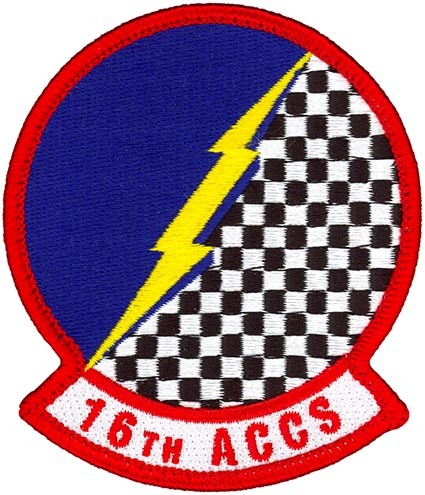 Redesignated as: 16 Tactical Reconnaissance Squadron, Night Photographic, on 10 Oct 1950; 16 Tactical Reconnaissance Squadron, Night Photographic-Jet, on 8 Nov 1955; 16 Tactical Reconnaissance Squadron, Photographic-Jet, on 1 Mar 1965; 16 Tactical Reconnaissance Squadron on 8 Oct 1966; 16 Tactical Reconnaissance Training Squadron on 1 Oct 1979; 16 Tactical Reconnaissance Squadron on 1 Jul 1982. Inactivated on 15 Dec 1989. Redesignated as 16 Airborne Command and Control Squadron on 15 Jan 1996. Allotted to the National Guard Bureau on 1 Oct 2002. Relieved from allotment to the National Guard Bureau, and assigned to Air Combat Command, on 1 Oct 2011. Assignments. 363 Fighter (later, 363 Tactical Reconnaissance) Group, 1 Mar 1943 (air echelon attached to 10 Photographic Group, 24 Dec 1944-6 Feb 1945); 10 Reconnaissance Group, 15 Nov 1945; Tactical Air Command, 25 Jun 1947; 363 Reconnaissance (later, 363 Tactical Reconnaissance) Group, 24 Jul 1947-26 Apr 1949. 363 Tactical Reconnaissance Group, 1 Sep 1950; 363 Tactical Reconnaissance Wing, 8 Feb 1958; 2 Air Division (attached to 6250 Combat Support Group), 30 Oct 1965; 460 Tactical Reconnaissance Wing, 18 Feb 1966; 475 Tactical Fighter Wing, 15 Mar 1970; 363 Tactical Reconnaissance (later, 363 Tactical Fighter) Wing, 15 Feb 1971-15 Dec 1989. 93 Operations Group, 1 Oct 1996; 116 Air Control Wing, 1 Oct 2002; 416 Operations Group, 1 Oct 2011-. Stations. Hamilton Field, CA, 1 Mar 1943; Santa Rosa AAFld, CA, 23 Aug 1943; Oakland Muni Aprt, CA, 8 Oct-2 Dec 1943; Keevil, England, 23 Dec 1943; Rivenhall, England, c. 3 Feb 1944; Staplehurst, England, 14 Apr 1944; Maupertus, France, c. 5 Jul 1944; Azeville, France, c. 22 Aug 1944; Montrevil, France, 9 Sep 1944; Sandweiler, Luxembourg, 11 Oct 1944; Le Culot, Belgium, 29 Oct 1944 (operated from Conflans, France, 24 Dec 1944-6 Feb 1945); Venlo, Holland, 11 Mar 1945; Gutersloh, Germany, 16 Apr 1945; Brunswick, Germany, 26 Apr 1945; Wiesbaden, Germany, 20 May 1945; Eschwege, Germany, 12 Jul 1945; Darmstadt, Germany, 22 Sep 1945; Furth, Germany, 24 Nov 1945; Furstenfeldbruck, Germany, 2 Mar 1947; Bad Kissengen, Germany, 14-25 Jun 1947; Langley Field (later, AFB), VA, 25 Jun 1947-26 Apr 1949. Langley AFB, VA, 1 Sep 1950; Shaw AFB, SC, 2 Apr 1951-27 Oct 1965 (operated from MacDill AFB, FL, 22 Oct-30 Nov 1962); Tan Son Nhut Afld (later, AB), South Vietnam, 30 Oct 1965; Misawa AB, Japan, 15 Mar 1970-15 Feb 1971; Shaw AFB, SC, 15 Feb 1971-15 Dec 1989. Robins AFB, GA, 1 Oct 1996-. Aircraft. P-39, 1943; P-51, 1944-1945, 1946-1947; F-6, 1944-1945, 1946-1947; FP-80, 1947-1949. RB-26, 1950-1955; RB-57, 1954-1956; RB-66, 1956-1965; RF-4, 1965-1971, 1971-1982, 1982-1989. E-8 Joint STARS, 1996-. Operations. Air defense until Nov 1943. Combat in Europe, 24 Feb 1944-5 May 1945. Replacement training, 1950-1953 and again 1971-1982. Reconnaissance over Cuba, Oct-Nov 1962. Combat in Southeast Asia, Oct 1965-Mar 1970. Tactical Reconnaissance, 1982-1989. Air combat control, 1996-. Squadron was not an Air National Guard (ANG) unit, but blended with active duty and ANG members, 2002-2011. Operated E-8 Joint SRARS (Surveillance Target Attack Radar System) that located, classified, tracked and targeted ground movements on the battlefield and communicated real-time information to US forces command posts, 2002-. Campaign Streamers. World War II: Air Offensive, Europe; Normandy; Northern France; Rhineland; Ardennes-Alsace; Central Europe; Air Combat, EAME Theater. Vietnam: Vietnam Defensive; Vietnam Air; Vietnam Air Offensive; Vietnam Air Offensive Phase II; Vietnam Air/Ground; Vietnam Air Offensive, Phase III; Vietnam Air Offensive, Phase IV; Tet 69/Counteroffensive; Vietnam Summer-Fall, 1969; Vietnam Winter-Spring, 1970. Decorations. Presidential Unit Citations (Southeast Asia): 18 Feb 1966-30 Jun 1967; 1 Sep 1967-10 Jul 1968; 11 Jul 1968-31 Aug 1969. Air Force Outstanding Unit Awards with Combat “V” Device: 1 Jul 1965-30 Jun 1966; 1 Jul 1966-30 Jun 1967; 1 Jul 1967-30 Jun 1968; 1 Jul 1969-[15 Mar] 1970. Air Force Outstanding Unit Awards: 23 Oct-24 Nov 1962; 1 Jul 1974-1 Jul 1976; 2 Jul 1976-30 Jun 1978; 1 Oct 1981-1 Jun 1983; 15 Sep 1989- Dec 1989; 31 Aug 2004-31 May 2006; 1 Jun 2006-31 May 2007. Cited in the Order of the Day, Belgian Army: 1 Oct-17 Dec 1944; 18 Dec 1944-15 Jan 1945. Belgian Fourragere. Republic of Vietnam Gallantry Cross with Palm: 1 Apr 1966-15 Mar 1970. Emblem. Approved on 31 Jul 1952; modified and approved by the Chief of Staff of the Air Force (CSAF) and recorded on 3 Feb 1995.